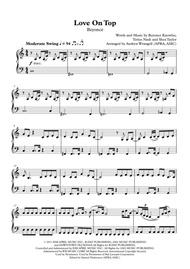 Arranged by Andrew Wrangell. Individual Part, Solo Part. 4 pages. Published by Andrew Wrangell (H0.204941-218444). Love On Top is a song about loving that your partner values you most, and they put you first. It's a happy, upbeat song from Beyoncé's album "4" from 2011 and the style is a throwback to the 1980's - Jackson 5, Stevie Wonder and Whitney Houston. Fun fact! The song includes four key changes and showcases Beyoncé's high range. It was number one on the US Hot R&B/Hip-Hop Songs chart for seven consecutive weeks, also winning a grammy for Best Traditional R&B Performance. 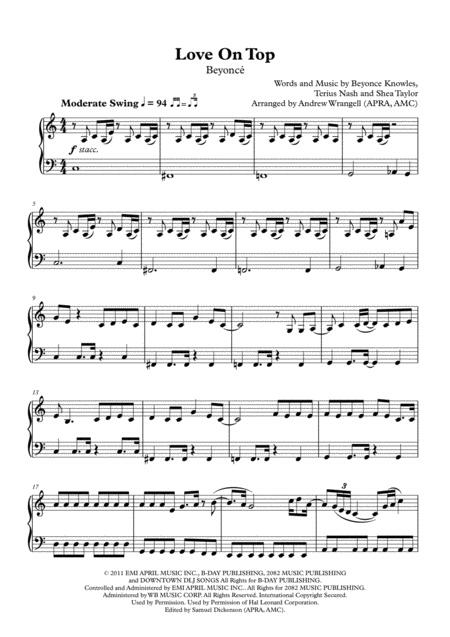 This Sheet Music Boss arrangement by Andrew Wrangell is approximately grade 3 level. It's a very well-known song song and sure to be a fantastic repertoire choice at a concert!